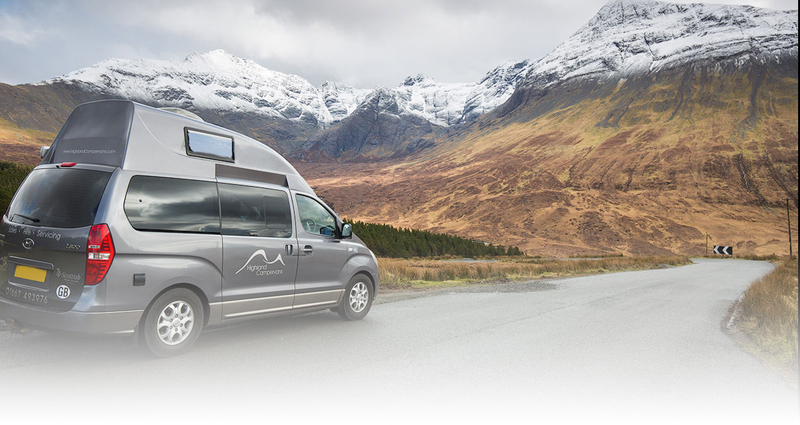 At Highland Campervans we believe in the freedom and adventure that a motorhome, campervan or caravan can bring. 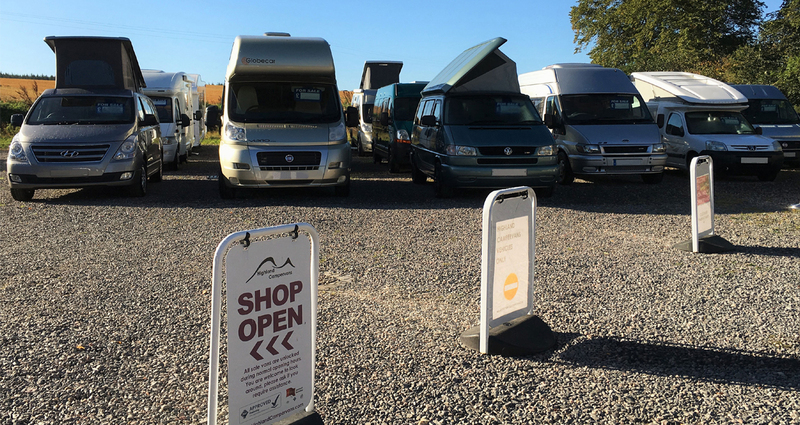 And if you're the kind of person who likes to make the most of their leisure time then Highland Campervans is there to help you every step of the way - from trying; to buying; to maintaining and selling. Our business is built on traditional Highland principles of honesty and integrity, which is why we are proud of the work we do to help our customers receive the best service possible. It's also why our staff are trained to the highest standards in the industry. We've put our faith in our business and you can too. The Directors - Catherine and Stephen Bunn - Having camped and caravanned since young, both Catherine and Stephen have a passion for campervans and motorhomes. 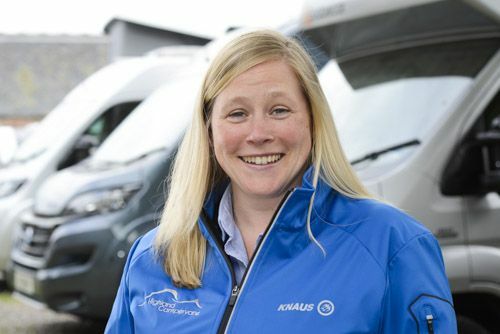 Catherine established Highland Campervans in 2007 with a small hire fleet, but the business has developed over the years to become the specialist centre in the Highlands for Motorhomes and Campervans. Out-growing its first premises, Highland Campers moved to Kerrowaird (an old dairy farm) in 2010. After some renovations and updates, the old milking parlour was transformed into an accessories shop, whilst the cow barn was re-born as an NCC Approved Workshop. The farm-yard area was landscaped and the NCC Approved Motorhome Dealership took shape. Hospitality Co-ordinator - Jo Page - Jo joined Highland Campervans in March 2015, assuming responsibility for all aspects of our hire fleet. She previously owned and ran a 4 star guest house in Inverness, so has excellent experience in the Highland hospitality industry. 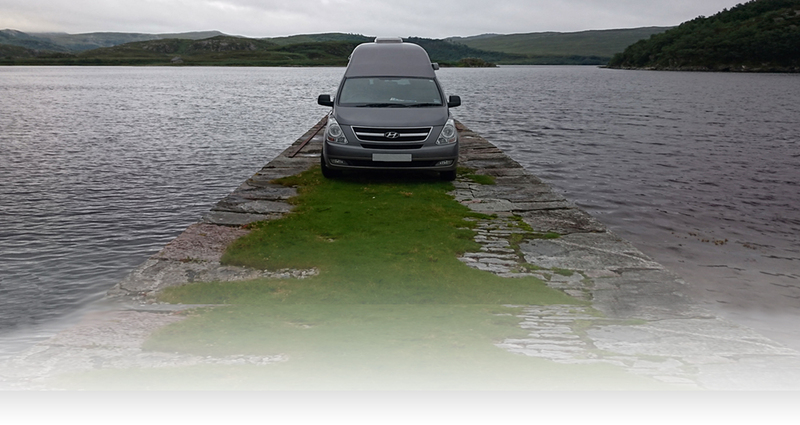 Jo is delighted to welcome hire customers to Highland Campervans and assist them with every step of their holiday. Jo is keen to get away in the hire fleet vans when possible to gather as much experience so she can enhance her recommendations and trip suggestions for our many customers. Hire and Retail Assistant - Lynda McQueen - Lynda started with Highland Campervans in April 2017. Lynda comes from a varied work background which started with stage management, and along the way she has worked with children but never animals! Prior to joining us her most recent experience has been in retail. Lynda is really looking forward to meeting and greeting customers, and helping those who have booked one of our vans head off on their motorhome adventure. Hire and Retail Assistant - Josef Tautcher - Josef joined the HCV team in April 2018. Josef comes from a Tourism and Sports Management background and continues to be heavily involved in Snowsports at a National Level as a Tutor and also as a Head Coach for a local club. 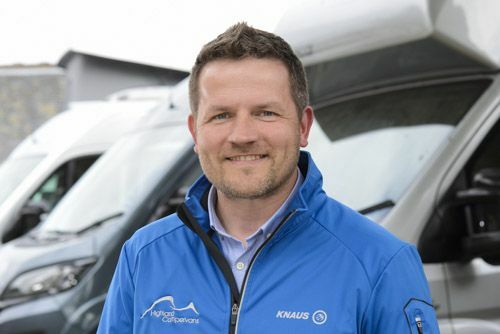 Josef is a keen motorhomer and looks forward to helping customers make the most of their adventure and feel comfortable using their motorhome. Josef also speaks fluent German which has been a great help with our many German speaking customers. Sales Advisor - Ray Atkinson - Ray joined Highland Campervans in October 2016. With a 25 year background in media, most recently working in marketing and advertising, Ray brings a varied and eclectic skills set to the role. Camping holidays with a wife and two daughters who enjoy their home comforts means that Ray lays claim to having invented Glamping. Now that his girls are off to University he’s looking forward to taking his camera into the countryside to explore the world of campervaning as well as matching customers with the perfect campervan for their own adventures. Service Co-ordinator - Derek Gordon - Derek joined the team at Highland Campervans in August 2017. He brings with him a variety of skills and experiences learned over the last twenty years working locally as a freelance photographer and more recently in fruit merchant and food production industries, along with a life-long love of the outdoors and campervans (VW’s in particular) - which fits ideally with his new role assisting caravan, campervan and motorhome users with repairs and servicing, over-seeing the smooth operation of Highland Campervans’ service department. Sales Advisor - Stephen Buckett - Motorhome and Caravan Sales Advisor Stephen Buckett joined us October 2018. Coming from a retail management background of 15 years, retailing Golf equipment to chocolate to Toys over the years. Stephen and his wife are proud owners of a new motorhome. They have travelled extensively round most of the coast of Scotland with TJ the cocker spaniel visiting many stunning locations. Stephen will be delighted to tell all our lovely customers about his trips while finding them the right vehicle to send them on their adventures. Aftersales and parts assistant - Rachael Buckett - Rachael joined us in October 2018, bringing with her years of retail management and administrative experience, her skills are not limited to these roles as she has also been a carer, ran her own B&B business on a small Scottish Island at the same time running the community café, not to mention volunteering locally and setting up a walking group. In her free time she loves nothing more than exploring the stunning Scottish Countryside with her husband and cocker spaniel TJ, in their very own Motorhome! She also is very creative and loves crafting. 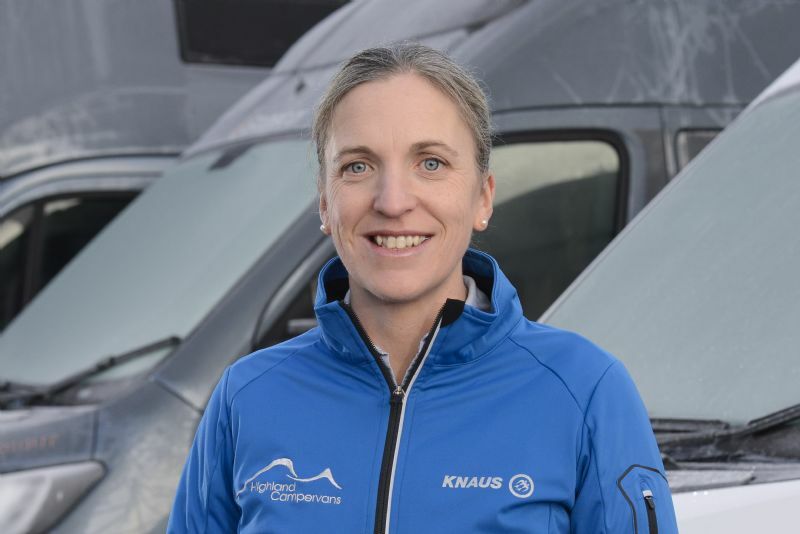 With Rachael’s wide range of skills, experiences and a passion for Motorhoming she is excited to be joining Highland Campervans. Service Technician - Mark Downey - Mark joined Highland Campervans in January 2018 as Service Technician. 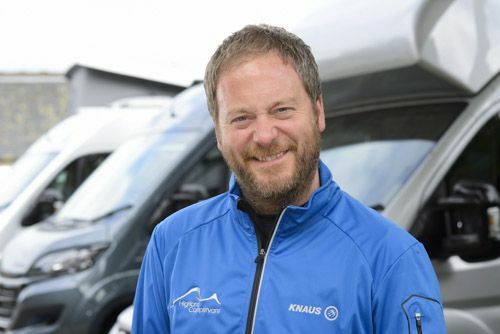 Mark brings with him a variety of skills and experience gained through various trades and a real passion for van life - perfect for his role servicing motorhomes and caravans in our busy workshop. Mark enjoys the challenge and is looking forward to expanding his knowledge as his training continues and his experience grows, helping us maintain a quality service to our service department customers. 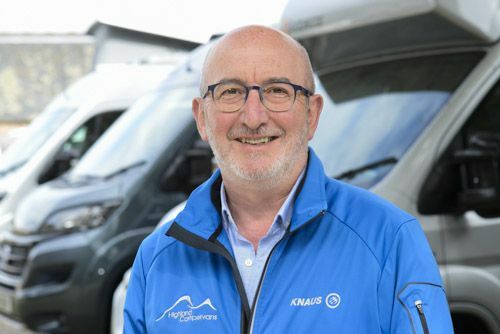 Keith Walsh - Service Technician - Keith joined Highland Campervans in August 2018. Keith is an established NCC mobile technician, who started his own mobile servicing business earlier this year. Keith currently divides his time between his business and working with our own servicing technicians in our busy workshop. Keith looks forward to developing this relationship as we head towards another busy season. Vehicle valeter - John Fitzsimmons - John joined the team in February 2018, having previously run his own successful valeting business for many years. He has been valeting our vehicles since 2012 and prides himself on exceptionally high standards in the interior and exterior preparation of our stock./ John is fully trained in the use of Autoglym products and in the application of GardX vehicle protection available from Highland Campervans. Originally from Manchester John has lived and worked in the Highlands for 18 years and enjoys everything this part of the world has to offer! The Cat - Hades - Chief mouse-catcher and guardian of the workshop. 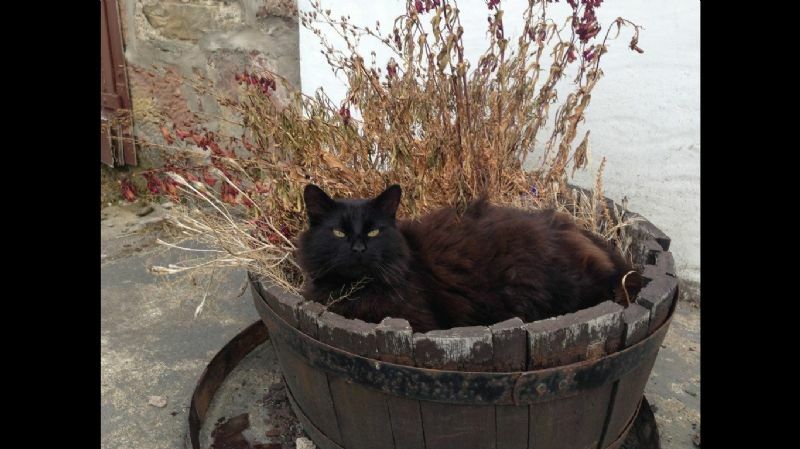 Hades joined the team in 2010 and works very hard at keeping small creatures away from the farm buildings. Adopted from a rescue centre who were struggling to find a home for his 'anti-social' tendencies, Hades joined the business with his bed in the barns. He has since decided that Kerrowaird Farm and Highland Campervans is his ideal home - and his anti-social tendencies have (almost) disappeared! Hades is an outdoor cat and is not supposed to be inside the reception or campervans - please feel free to nudge him outside if he sneaks his way in! Neil Hillyard - Accounts Advisor. Neil joined the team in summer 2011 to help Catherine and Stephen keep a financial eye on the growing business. With huge investments in the workshop and shop, Neil looks at the numbers behind the scenes and checks that each area of the business is healthy and growing steadily. An invaluable asset to any business! Summer Intern - We offer a paid summer placement for an undergraduate looking to gain valuable work experience prior to completing their degree. Please contact us if you would like to receive details of the summer internship. We are happy to work with universities if assessments are required towards degree modules.